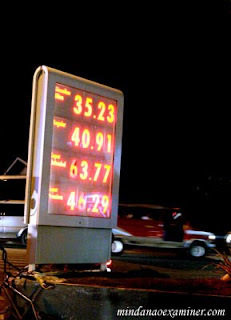 High gas prices in the Philippines remain the problems and woes of many motorists in the country, especially in the provinces such as these current pump prices in Zamboanga City in Mindanao. (Mindanao Examiner Photo). MANILA, Philippines - House Speaker Prospero Nograles said he is amenable for a temporary lifting of the Executive Order 839 that placed petroleum products under price control, provided oil companies will agree to full disclosure of their stock inventories and importation records that will justify any price adjustment as soon as the EO is lifted. Nograles said that while he recognizes the need to balance public welfare and healthy business environment, the State must assert its will to protect its citizens from abusive business practices, including cartelization and price manipulation in the oil industry. "The debate on whether or not our oil companies, particularly the so-called Big 3, should now be resolved. The only way we can have the most accurate conclusion is for the oil firms to open their books and show the public that all the negative things attributed to them are just misconceptions. I understand that business is for profit, but raking in unreasonable profits at the expense of public interest and when the public is left with no or little choice is absolutely unconscionable," said Nograles.